Here are some snazzy birthday facts about 26th of January 1959 that no one tells you about. Don’t wait a minute longer and jump in using the content links below. Average read time of 10 minutes. Enjoy! What day was my birthday Jan 26, 1959? January 26, 1959 was a Monday and it was the 26th day of the year 1959. It was the 4th Monday of that year. The next time you can reuse your old 1959 calendar will be in 2026. Both calendars will be exactly the same! This is assuming you are not interested in the dates for Easter and other irregular holidays that are based on a lunisolar calendar. There are 283 days left before your next birthday. You will be 61 years old when that day comes. There have been 21,997 days from the day you were born up to today. If you’ve been sleeping 8 hours daily since birth, then you have slept a total of 7,332 days or 20.07 years. You spent 33% of your life sleeping. Since night and day always follow each other, there were precisely 744 full moons after you were born up to this day. How many of them did you see? The next full moon that you can see will be on April 19 at 11:14:00 GMT – Friday. Fun stat: Your first one billion seconds (1,000,000,000) happened sometime on October 4, 1990. If a dog named Marlin - a Afghan Hound breed, was born on the same date as you then it will be 325 dog years old today. A dog’s first human year is equal to 15 dog years. Dogs age differently depending on breed and size. When you reach the age of 6 Marlin will be 45 dog years old. From that point forward a large-sized dog like Marlin will age 5-6 dog years for every human year. The Council of Trent issues its conclusions in the Tridentinum, establishing a distinction between Roman Catholicism and Protestantism. The Grand Duchy of Lithuania defeats the Tsardom of Russia in the Battle of Ula during the Livonian War. Treaty of Karlowitz is signed. The world’s largest diamond ever, the Cullinan weighing 3106.75 carat, is found at the Premier Mine near Pretoria in South Africa. Spanish Civil War – Catalonia Offensive: Troops loyal to nationalist General Francisco Franco and aided by Italy take Barcelona. The Constitution of India comes into force, forming a republic. Rajendra Prasad is sworn in as its first President of India. Observed as Republic Day in India. Soviet Union hands Porkkala back to Finland. Japanese ferry Nankai Maru capsizes off southern Awaji Island, Japan, 167 killed. What does my birthday January 26, 1959 mean? Your birthday numbers 1, 26, and 1959 reveal that your Life Path number is 6. It represents justice, nurturing and responsibility. You possess great compassion and seek to be of service to others. The following celebrities also have the same life path number: Robert Sterling, Jeremy Michael Ward, Georgia Horsley, Christopher Cross, Daniel Mendaille, Sandy Posey, Selina Jen, Ronny Cox, Mary Elizabeth Mastrantonio, Brian Culbertson. 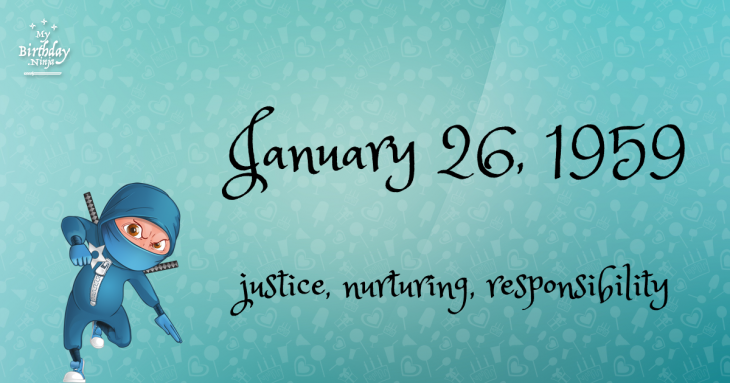 What is the birthday horoscope for Jan 26, 1959? The Western zodiac or sun sign of a person born on January 26 is Aquarius ♒ (The Water-bearer) – a fixed sign with Air as Western element. The ruling planet is Uranus – the planet of originality. According to the ancient art of Chinese astrology (or Eastern zodiac), Dog is the mythical animal and Earth is the Eastern element of a person born on January 26, 1959. Fun fact: The birth flower for 26th January 1959 is Carnation for friendship. What is the Love Match for Jan 26, 1959? When it comes to love and relationship, you are most compatible with a person born on June 5, 1972. You have a Love Match compatibility score of +113. Imagine being in love with your soul mate. On the negative side, you are most incompatible with a person born on August 4, 1955. Your incompatibility score is -135. You’ll be like a cat and a dog on a love-hate relationship. Arf-arf, I want to bite you. Meow-meow, stay away from me! The number-one hit song in the U.S. at the day of your birth was Smoke Gets in Your Eyes by The Platters as compiled by Billboard Hot 100 (January 26, 1959). Ask your parents if they know this popular song. I do not know how you feel about this, but you were a male ♂ in your last earthly incarnation. You were born somewhere around the territory of Alaska approximately on 575. Your profession was librarian, priest, keeper of tribal relics. How many babies were born on January 26, 1959? Base on the data published by the United Nations Population Division, an estimated 105,573,458 babies were born throughout the world in the year 1959. The estimated number of babies born on 26th January 1959 is 289,242. That’s equivalent to 201 babies every minute. Try to imagine if all of them are crying at the same time. What is the popular baby name on 26 Jan 1959? Here’s a quick list of all the fun birthday facts about January 26, 1959. Celebrities, famous birthdays, historical events, and past life were excluded. 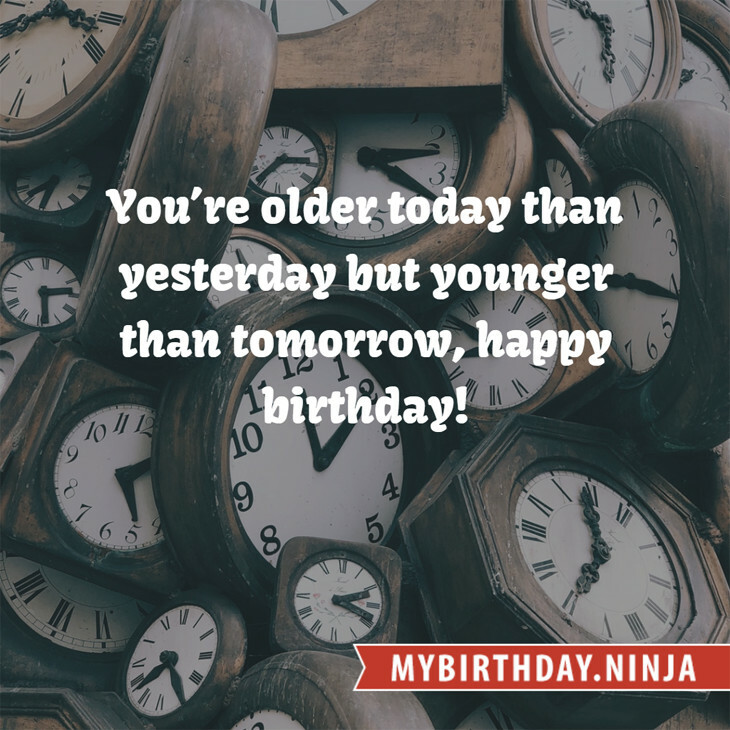 Try another birth date of someone you know or try the birthday of these celebrities: July 17, 2000 – Nico Liersch, German actor; October 28, 1967 – Monica Chan, Hong Kong model and actress, Miss Hong Kong 1989; August 12, 1980 – Dominique Swain, American actress.